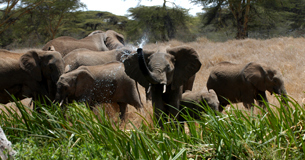 The Queen Elizabeth National Park (QENP) in Uganda is a Biosphere Reserve and is inhabitated by people and wildlife. It is bordered on its western boundary by Lake Edward. The southern sector of QENP forms the largest and most significant connection to the Democratic Republic of Congo’s Parc National des Virunga and provides a corridor for elephants and other wildlife. There are 11 fishing villages all of which connect to the region’s main roads that pass straight through QENP. With legal access across the park and now improved communications (mobile phones), poachers are able to monitor ranger movements along the roads and in their ranger posts. The Waterways project will reduce poaching capabilities (policing of the bushmeat trade, ivory trafficking and illegal fishing) in the Southern Queen Elizabeth Conservation Area and protect wildlife and their habitats through facilitating water borne law enforcement, research and community conservation. The installation of ranger boat stations and the use of boats in QENP will have an enormous impact on the ability of law enforcement to reverse QENP’s poaching problem. Rangers will now have the ability to be deployed by boat eliminating long driving distances. Rangers can also be deployed anywhere along the shore line, silently and without detection. In addition many poachers and wildlife traffickers are thought to be moving dried meat and animals completely unchallenged through the waterways where they then liaise with vehicles. Rangers in boats will prevent this illegal activity forcing poachers to travel the lengthy and hazardous land route. The Waterways project will also initiate a ‘marine operations’ capacity building programme, provide the means by which wildlife monitoring and research can take place, and initiate ‘Lake Rescue’ as a new community conservation program.